Electronic duo Audio Bullys hails from the United Kingdom and consists of Simon Franks and Tom Dinsdale. The pair launched their debut album Ego War in 2003 to positive reviews and they have since released two more LPs: Generation and Higher Than The Eiffel. Released last March on the Cooking Vinyl label, Higher Than The Eiffel is the duo’s first album in over four years and it’s possibly their finest so far. To make this record, Franks and Dinsdale burried themselves in a studio for six months, far from record companies and other external influences, and they tried to recapture the magic of their original sound. 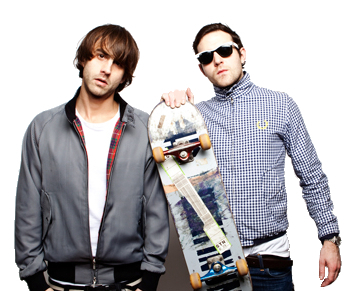 On Higher Than The Eiffel, they merge elements of breaks, hip-hop, punk, garage and house with clever beats and samples. The result is an album that sounds exactly the way it should: 100% Audio Bullys!